Also serving communities of Tremonton. The average cost of assisted living in Brigham City is $2,725 per month. This is lower than the national median of $3,346. Cheaper nearby regions include Logan with an average starting cost of $2,495. To help you with your search, browse the 7 reviews below for assisted living facilities in Brigham City. On average, consumers rate assisted living in Brigham City 3.7 out of 5 stars. Better rated regions include Logan with an average rating of 4.2 out of 5 stars. Caring.com has helped thousands of families find high-quality senior care. To speak with one of our Family Advisors about assisted living options and costs in Brigham City, call (855) 863-8283. Approximately 18,000 people live in Brigham City, a rural area in northern Utah. History and art enthusiasts of all ages enjoy immersing themselves in Brigham City's interesting history at the Brigham City Museum of Art and History, and elderly residents play BINGO, eat meals and sing karaoke at the Brigham City Senior Center. Brigham also has four local assisted living facilities, which include three in Brigham City and one in Hyrum for aging residents who need help with daily tasks. These facilities are monitored by the Health Facility Licensing, Certification and Resident Assessment Bureau, a division of the Utah Department of Health. Residents navigate the Brigham City area with help from the Utah Transit Authority's bus routes. Seniors qualify for reduced fares that typically cost half as much as nondiscounted passenger fares. Brigham City residents breathe cleaner air than many U.S. residents. The city has an air quality score of 78, which is 20 points higher than the U.S. average. Seniors sensitive to heat may find it difficult to endure the hot summers of Brigham City when temperatures hit the 90s. Winters are cold, with average lows in the 20s. The city generally does not experience long periods of excessive rainfall or heavy snow. The Brigham City area is home to world-class medical facilities, including Brigham City Community Hospital, in the event of medical emergencies or illness. The cost of living is lower in Brigham City than the national average, so seniors can generally live comfortably on their retirement income. Nearby cities such as Perry, Mantua and Wellsville have a higher cost of living than Brigham City. Violent crimes occur at a slightly higher rate in Brigham City than the Utah average. The city is safer than 22 percent of U.S. locations. On average, 21 crimes occur per square mile in Brigham City. Assisted Living costs in Brigham City start around $2,725 per month on average, while the nationwide average cost of assisted living is $4,000 per month, according to the latest figures from Genworth’s Cost of Care Survey. It’s important to note that assisted living rates in Brigham City and the surrounding suburbs can vary widely based on factors such as location, the level of care needed, apartment size and the types of amenities offered at each community. 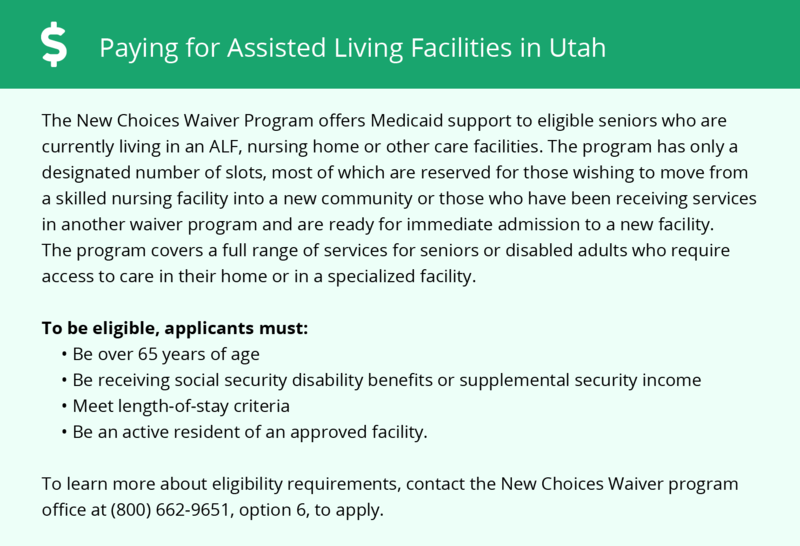 Seniors in Brigham City, Utah, may qualify for financial assistance from the New Choices Waiver or the Aging Waiver for Individuals Age 65 or Older. 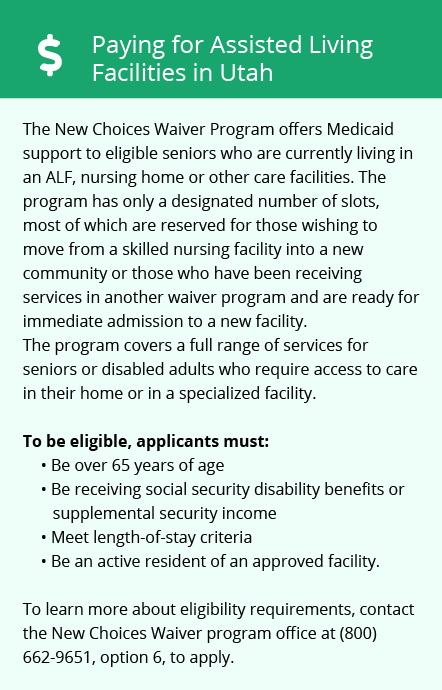 These Medicaid-managed programs have income and asset restrictions and require that seniors demonstrate a need for assisted living care prior to enrollment at a facility. Brigham City and the surrounding area are home to numerous government agencies and non-profit organizations offering help for seniors searching for or currently residing in an assisted living community. These organizations can also provide assistance in a number of other eldercare services such as geriatric care management, elder law advice, estate planning, finding home care and health and wellness programs. To see a list of free assisted living resources in Brigham City, please visit our Assisted Living in Utah page. Brigham City-area assisted living communities must adhere to the comprehensive set of state laws and regulations that all assisted living communities in Utah are required to follow. Visit our Assisted Living in Utah page for more information about these laws.